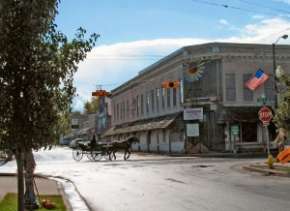 Grabill, Indiana is located in northeast Allen County and offers a glimpse of an authentic, living Amish community filled with fascinating shops, rural scenes, picturesque farms and horse drawn vehicles. The Country Shops of Grabill featuring over 150 antique and flea market vendors in the historic Souder&apos;s Building. Housed in the most recognized building in Grabill, the H. Souder General Store is a delight for children of all ages. Enjoy penny candy and bottled soda, find delightful rustic home décor, old fashioned toys and games, home remedies, and more! Be sure to come hungry, because Grabill has many great restaurants to enjoy! From the Dairy Sweet (a destination in itself for its burgers and ice cream), to the Grabill Inn, the only full-service sit down restaurant that is open daily. You may also enjoy the hot buffet and salad bar at Grabill Country Sales (a bulk food store). For special occasions, make plans to visit Nolt&apos;s Amish Restaurant, which features authentic Amish cooking with limited Friday and Saturday hours. Be sure to call ahead and ask about the Amish acapella signing and yodeling on Friday nights. Spencerville Covered Bridge - Just 6 miles from Grabill, this is one of the region&apos;s oldest and most treasured covered bridges. Leo also offers wonderful outdoor recreation at the Hurshtown Reservoir (where you can rent a canoe) and at Riverside Park (which features biking and walking trails and a new splashpad) and the Leo-Cedarville Imagination Station, a wooden playground that is every child&apos;s delight! And, mark your calendar the Grabill Country Fair - always the first Thurs-Saturday after Labor Day weekend. Amazing food, music, activities and fun - its truly a good old-time country fair! If you’re looking to get out of the city and enjoy a taste of the country life, drive through the quiet yet beautiful country roads to Grabill, Indiana. 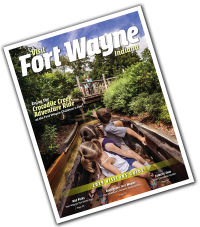 This northern neighbor of Fort Wayne is filled with rolling farms that will show you some of Indiana’s most classic and beautiful scenery while also exploring a traditional Amish community. Just 18 miles from downtown Fort Wayne, this traditional Amish community provides scenic views so follow the map below for a picturesque drive that you won’t forget. Drive in on State Rd 37 to come across (A) Schmucker’s Amish Produce Market, a beautiful family owned farm that sells fresh Amish produce. The big trees provide the perfect shade over their extensive flower gardens and produce stands, and their gorgeous horses make this the perfect first stop. Next, take a left onto Cuba Rd, a left onto Antwerp Rd, and a right onto Roth Rd to drive by an (B) Amish Graveyard and look at the traditional lovely headstones that give you a small glimpse into this community’s history. If you’re looking to stretch your legs and find some Grabill souvenirs, stop and try our Grabill Shopping Tour where you can experience all of the towns favorite shops! 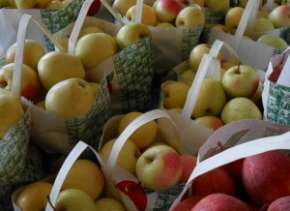 The scenic drive to (C) A&M Amish Grocery will be sure to impress you as you drive among beautiful fields and wildlife. To get to our next stop, continue down Roth Rd and take a right onto Grabill Rd and then take a left onto Spencerville Rd until you hit Hurshtown Rd. After you’re done looking at this quaint store on the outskirts of Grabill, take a left down Hurshtown Rd to see our next beautiful stop. Head all the way down Hurshtown Rd until you take a right onto Roth Rd, and then a right onto St Rd 1, and finally another right onto CR 68 where you will find the famous (D) Spencerville Covered Bridge. This historical bridge is set on top of the St. Joseph River and provides the perfect stop to not only admire classic Amish architecture but also the rushing water of the river. Once you’re done admiring this local favorite, head back onto CR 68 and take a left on St. Rd 1. Next, take a left onto Van Zile Rd to stumble upon the serene (E) Hurshtown Reservoir. This park offers unbeatable views of the reservoir where you can walk 2.75 miles around it on a walking path or take you chance at fishing on the water. Whether your stopping to take advantage of any one of the incredible amenities this park has to offer or just driving by to enjoy the views, this is sure to be a stop you don’t want to miss. Next, continue down Hurshtown Rd and take a left onto Page Rd where you will soon see the (F) Cedar Creek Amish School on your left. Take a minute to appreciate this quaint school that gives you a look back into simpler times. The beautiful fields that surround the school accompany the rustic buildings to make this a meaningful stop on the tour. Finally, continue down Page Rd, take a right onto Grabill Rd, and then a left onto Schwartz Rd to find our final stop. (G) Riverside Park and Gardens is known for its gorgeous fountains, gazebos, and walking trails along with it’s delightful splashpad which makes the perfect stop to end our tour. Regardless of what path you take, the quiet roads of Grabill will give you a glimpse into the simple life of this traditional Amish community. Feel the wind rushing through your car as your drive along the countryside for a day full of peaceful and picturesque views. And who knows, you may even get the chance to see a classic horse and buggy trotting down the road alongside you. Grabill, Indiana is a charming rural town that will quickly transport you back into a simpler time in history. 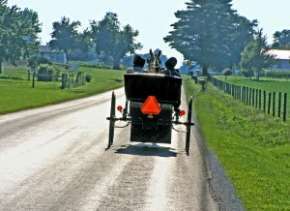 The comforting sound of horse’s hooves on the roads will accompany your fresh homemade dessert, making this local Amish community seem like home. If you want to hit some of Grabill’s most famous and treasured spots, follow the map below for an incredible day. Start with our driving tour to enjoy the countryside, then stop in the town of Grabill to enjoy this shopping tour! Das Nolt Family Dinner Haus: What’s the best way to start your day in Grabill, Indiana? By visiting and trying some of this small town’s best food. Turn left onto Cuba Rd from State Rd 37 to hit our first local gem and learn about the rich history that fills this restaurant. This family owned restaurant is full delicious food that will make it hard to decide what to order and it will make it hard to leave this heartwarming experience. Miller’s Country Store: The perfect way to kick off your local shopping experience, is to stop by Turn left out of Das Nolt and take a right onto Antwerp Rd to find this traditional country store that is full of everything from Amish woodcrafts to herbs and vitamins. Browse among their wide selection of specialty items that make this a fun stop on the tour. Katie’s Kountry Korner: Take a right onto Schwartz Rd from Antwerp Rd to find our third stop on the tour - Katie’s Kountry Korner. This shop is the perfect image of the small Amish community as its white picket fences and large flower pots give you that small town feel. The perfectly trimmed grass leads you inside to a cozy shop filled with traditional Amish capes and hats, handmade quilts, loads of beautiful fabrics, and so much more. Make sure to stop by this local beloved store to glimpse into this town’s traditional shopping stop. Grabill Country Meats: From Schwartz Rd, take a right onto Witmer Rd and just two streets on your right you will soon see our fourth stop, Grabill Country Meats. This family business takes pride in the work they put into their high-quality meat, which you can be sure to see throughout their store. Their freshly cooked and canned meat are perfect for anyone that’s a little too busy but still wants a delicious meal. The rustic labels accompany the homey feel this store portrays, and the products are perfect gifts for any camper or traveler in the family. Catalpa Tree Shops: Coming from 2nd St (Witmer Rd), turn left onto Main St where you will stumble upon our fifth stop – Catalpa Tree Shops. Although it may look like a quaint house on the outside, the inside holds many special surprises. This local resource center, located near downtown Grabill, is the perfect place to get more in touch with your spiritual side. Find metaphysical books, gifts, and music along with classes in art, health, or metaphysical modes in this one of a kind shop. H. Souder and Son’s General Store: From there, continue down Main St where you will soon see on your left, which is our sixth stop on the tour. Located in the heart of Fort Wayne’s Amish country, H. Souder and Son’s will transport you back in time. This local candy and gift shop offers anything from sweets to homemade soaps and everything else in between. This is the perfect place to find nostalgic gifts and snacks that will take you back to a simpler time. The Coffee Cabin: Tucked just behind this local favorite is our seventh stop, the Coffee Cabin. The wonderful aromas of freshly-baked gooey cinnamon rolls and brewed coffee will pull you into this little shop where you will find a long list of specialty drinks and treats to enjoy on your day in Grabill. The Country Shops Country Style Flea Market: Located directly to the right of the General Store, and in front of the Coffee Cabin, on the corner of Main St and Grabill Rd, is our eighth stop – The Country Shops Country Style Flea Market. The Country Shops of Grabill has more than 150 vendors spanning over two floors and is full of antiques, handmade crafts, vintage furniture and more. Make sure to stop in this historic building to find your own treasures. Grabill Hardware: If you’re looking for a twist on your usual hardware store, then is a stop you won’t want to miss. Located directly across the street from The Country Shops, our ninth stop adds some local Amish flare to the national chain of Do It Best. 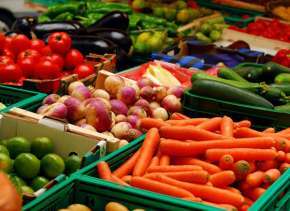 Although this is a widely recognized business, the personal touch and care this town puts into their local store makes this a great experience for whoever walks in the front door. My Heart and Home: After you’re done at Grabill Hardware, take a left onto Grabill Rd where you will soon find on your right – our tenth stop on our tour. This small retail store has all the small vintage knickknacks your heart could ever want, and the comfort of it being inside a local home makes this an unmissable stop. Grabill Country Sales: After you’ve found your perfect gift at My Heart and Home, take a right down Grabill Rd and take the scenic drive all the way to on Fairview Dr. Enjoy delicious food and homemade products that were made in the old-world Amish fashion at our eleventh stop. Try fresh baked cookies and soups along with sweet mouth-watering candy to make this an unforgettable stop on your trip through Amish country. Dairy Sweet: Finally, continue down Grabill Rd to find on your right which is our twelfth and final stop on our tour of Grabill. This quaint local diner will satisfy any craving with their delicious burgers, sandwiches, desserts and much more! Their homemade ice cream and friendly staff will be sure to have you coming back for seconds and is the perfect way to end your day. Leo Shopping: If you’re done filling your stomach and shopping bags at some of Grabill’s favorite stops, turn right onto Grabill Rd to get some more shopping done at these shops in the neighboring community of Leo. Located at the edge of Grabill, Leo is home to a collection of personalized shops that are perfect to add to your day trip. Stop by the family-run business of Olde Church Shoppes to explore among 3 floors of interesting gifts, books, crafts, antiques, and more! For another store that will give you a personal touch is Just Be. Aside from its collection of cute clothes, this boutique offers unbeatable customer service from the owner herself to make this an amazing experience. Make sure to head into Abode, an eye-catching store that will surprise you with their extensive inventory of stylish home goods and décor. Finally, stop into Gallery Shoppes to find unique gifts, home décor, and local art to wrap up this wonderful cluster of shops that will satisfy any taste.